Nasser Al-Attiyah's 11th stage victory means he has closed the gap on Dakar leader Carlos Sainz to just over four minutes. (CNN) -- Nasser Al-Attiyah closed the gap on Volkswagen team-mate Carlos Sainz's overall Dakar Rally lead after winning Wednesday's 220km 11th stage to San Juan in Argentina. Al-Attiyah, who was leading when disqualified last year, gained over five minutes on Sainz, with BMW driver Guerlain Chicherit taking the stage honors. Qatari Al-Attiyah told reporters: "I thought this stage would be easy, but it wasn't. We were in the dust behind Carlos and when we went off the road we hit a big tree. "We are lucky we did not roll the car. The next three days will be very long," added the 39-year-old, who is now only four minutes and 28 seconds behind former world rally champion Sainz. Meanwhile, Dutchman Frans Verhoeven won the motorcycling section, edging out American Jonah Street by just three seconds. 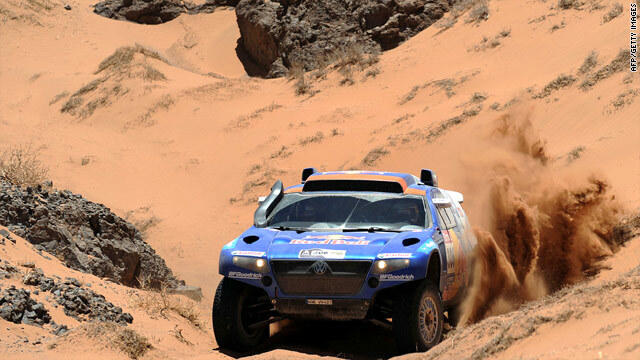 Frenchman Cyril Despres finished seventh on the stage, over four minutes in arrears, but retains the overall lead with just three stages of the race remaining. Despres, whose main pre-race rival for the title Spaniard Marc Coma saw his chances disappear last weekend when he was penalized six hours for illegally changing a tire, has a lead of one hour, 20 minutes over Norwegian Pal Ullevalseter.